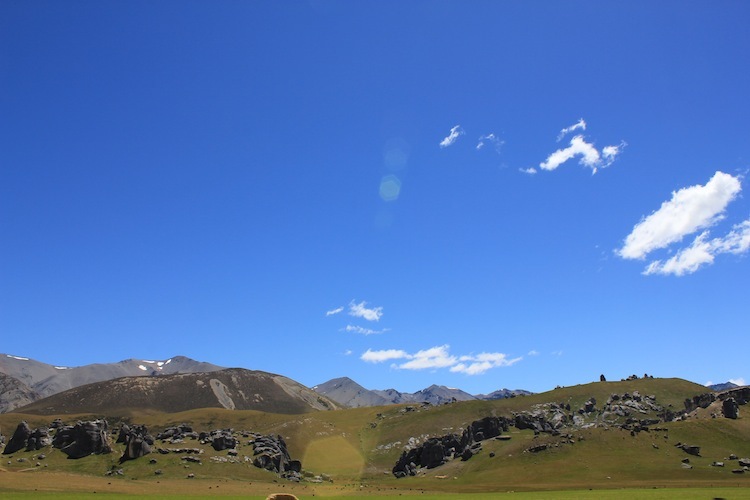 The weather had improved since the previous night, but was still a bit threatening, and we were concerned it might deteriorate again during our cross-continental east->west drive. 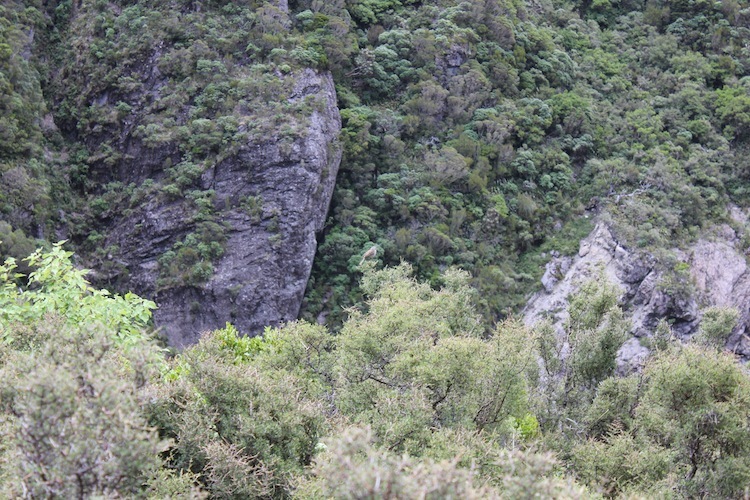 and doing a quick cheaters tour of the surrounding area, we drove back out of the volcano crater towards Christchurch, snapping another pic of the now less tumultuous valley from the same spot as the night before. 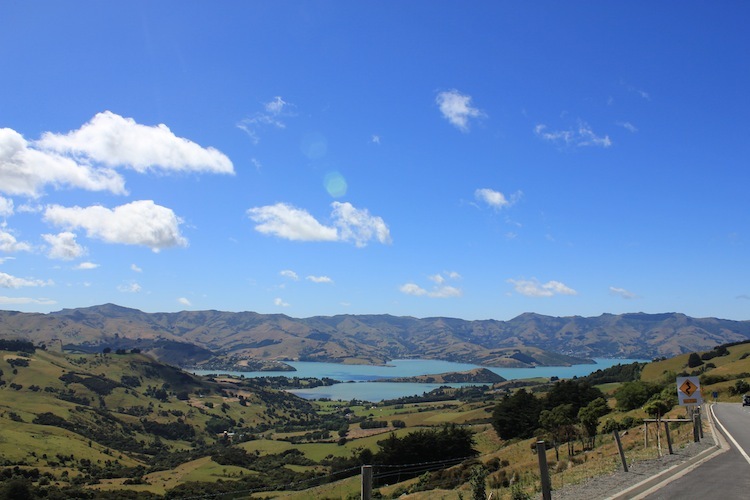 We originally wanted to visit Akaroa due to its fame as a harbour for one of NZs penguin populations, but apparently the penguins are only around the Banks peninsula for mating and such, and that NSFW activity had unfortunately subsided months ago. As far as I’m concerned, if it’s not in a tux, it’s not a penguin anyway, so I wasn’t too disappointed, but Julie seems to think that anything that is officially categorized and named a penguin is a penguin, so she was somewhat crestfallen that we would not be able to see any. 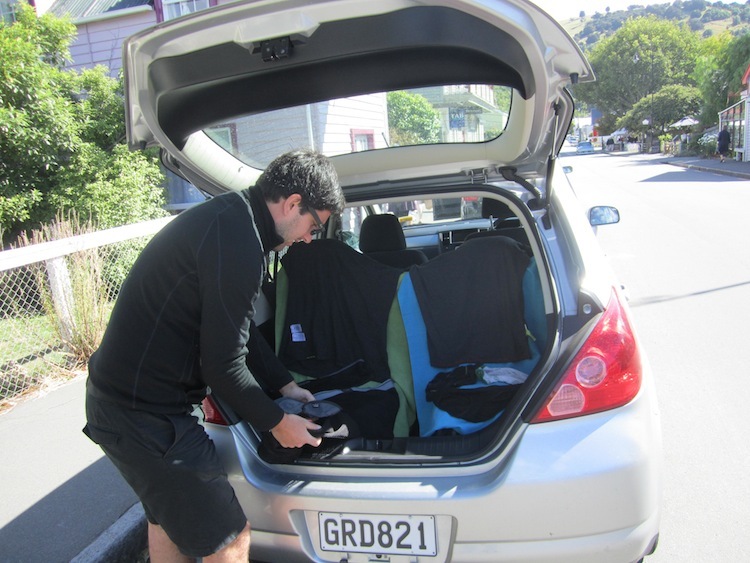 After some more arguing about what qualifies as a penguin, we continued our drive westward back around Christchurch. I know that most of it was done in a studio, but I couldn’t help (loudly and off-key) humming the theme song and feeling like we were driving onto the set as we proceeded further and further into the mountains. I kept hoping Legolas and Aragorn and the whole bunch would appear over the next hill running from orcs or something (yes, cliché I know, but you have to admit, since we’ve been in NZ I’ve kept the LOTR references to a minimum thus far and have practically earned the right to pepper this bloggggggg entry with clichés…), but no such luck. 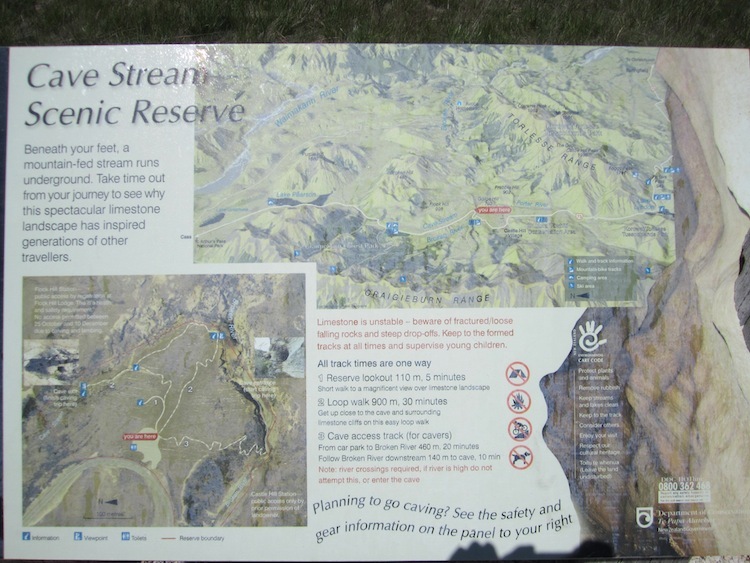 What we did discover though was the ‘Cave Stream Scenic Reserve’, which had actually been recommended to us by another traveller (Jan from Deutschland) at hostel in Wellington. 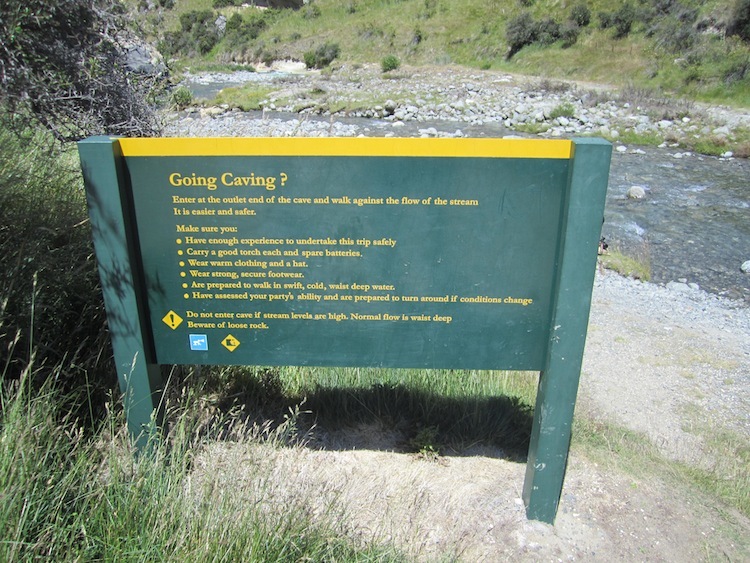 What he’d said is that there is a limestone cave along the road to Arthur’s Pass, and that you can go in and walk through it if you have a light. He essentially made it sound easy, like a walk in the park, but once we stopped at the parking lot for the trek, the signs around the parking lot made it clear that in fact it was a pretty difficult activity and that we should be wearing wetsuits (or at very least wool clothes), helmets, headlamps (with extra batteries) and hiking boots before endeavouring to pass through the cave. 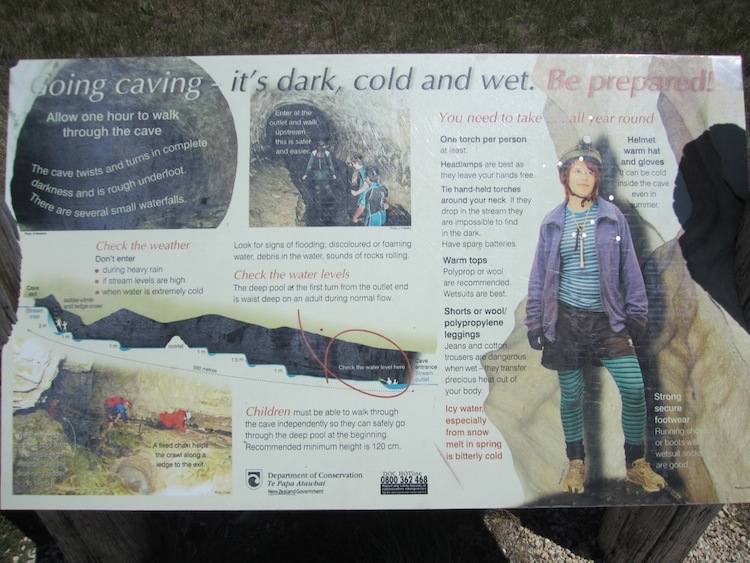 We had already changed into bathing suits and flip flops, and Julie was wearing cotton leggings by the time we read these signs, so obviously a change of attire was in order. After we layered up with all the wool clothes in our bags, we actually felt like it might be doable, especially since we both had headlamps (we’d envisioned using them strictly for being polite to our hostel dorm mates if we needed to rummage through our bags after lights out), and had been encouraged to do it by Jan. 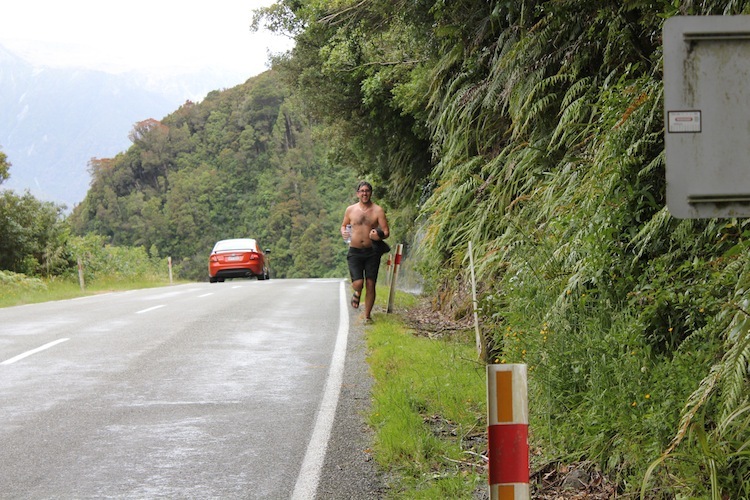 So, off we went, on the 20 minute walk to the mouth of the cave, which I prescribed that we jog to in order to warm up. Although we’d been warned that we would need to get wet, we still had to seriously psych ourselves out to cross the first little stream that we encountered. Knowing that water was on the menu made it easier for me, so I just went for it and got soaked, but Julie wouldn’t come across without some light coaxing. 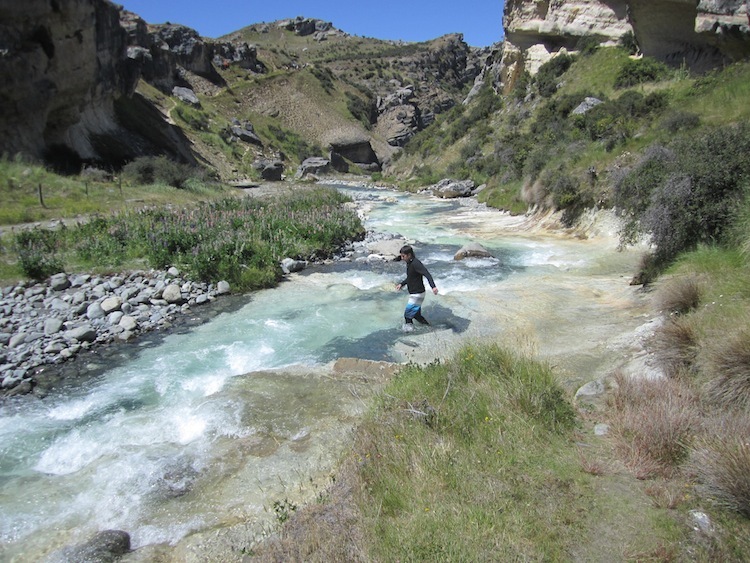 When we had to cross again, this time where the ‘stream’ was a bit deeper and more quickly flowing (I’d call it a river at this point), I chose a path and went for it, getting a bit more wet (still below the knees) and with a bit more coaxing got Julie to come over as well. The mouth was about 10m wide, with a tributary of the main ‘stream’ flowing out of it. It loomed before us like the gaping jaws of some sinister beast, and I knew my worst fears would be realized upon stepping inside. I could not, however, let even a shred of this fear show outwardly, or Julie would smell it on me and be even more afraid by transference and run immediately back to the car. She was already scared enough, and I wasn’t about to let her see my worst fears come to light (being buried alive by a million tons of rock and stone, having the lights go out a kilometer underground, getting stuck in a crevasse, getting eaten alive by albino cave monsters… you know, the usual fears…). 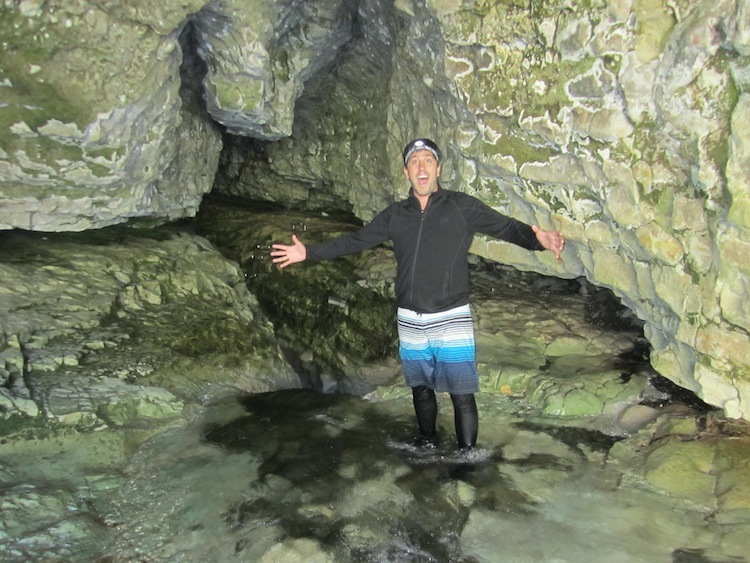 The sign in the parking lot had alerted us to the fact that we would need to check the water level in the pool at the mouth of the cave to ensure that it was safe to traverse, and since I was already wet almost to the knees I decided to brave it. 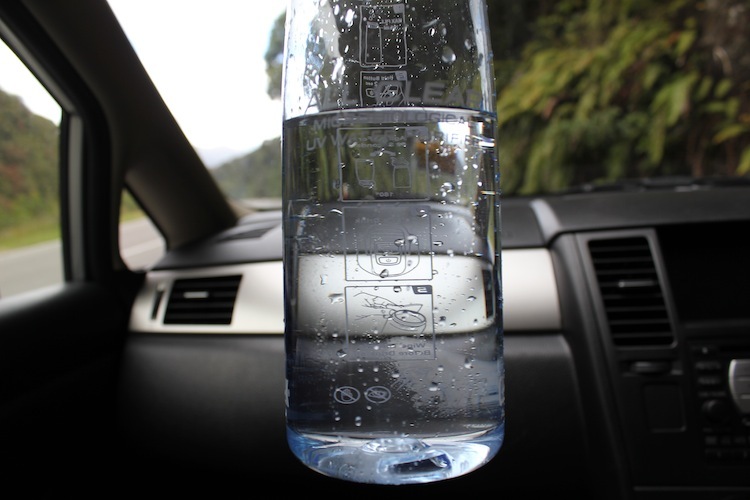 The water came up to my chest, and I could see nothing but darkness around the first corner. And this was with my headlamp on high. I beckoned to Julie to come join me (mostly to alleviate my fears, which are compounded while alone), and she inched slowly towards me, getting more and more soaked as she progressed. By the time the water reached her chest, she was shivering and whimpering all the while the darkness encroaching further. She began hyperventilating, and when she became unresponsive I knew it was time to leave. I ran (swam) towards her and we rushed back into the sweet sweet daylight. We were both soaked up to our chests, and not looking forward to going back to the car to dry off and lick the perceived (real?) wounds to our pride. 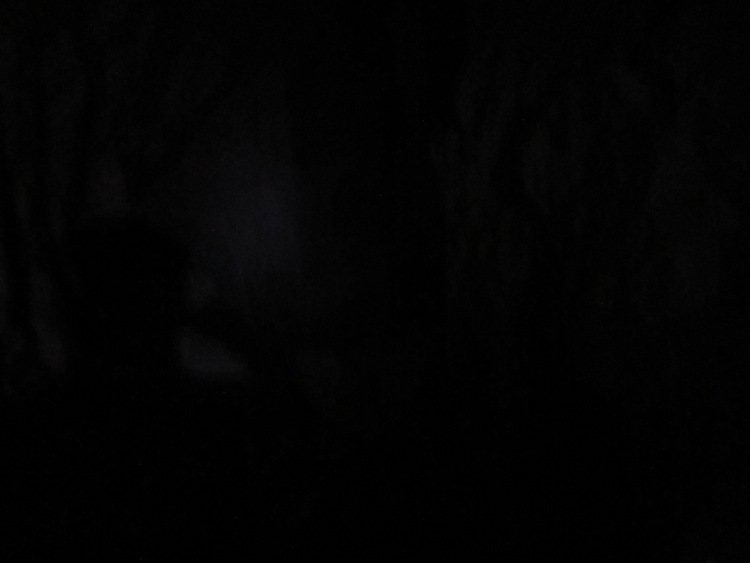 I had another look in the cave, and tried to convince myself that we could do it. That I could overcome my worst fears. I kept thinking that if someone else would come along and go in first, we could just follow them in and make it through no problem, and I looked around for these saviours to no avail as Julie waited just inside. Unfortunately, the tour bus full of wet extreme-looking youngsters that we’d seen leaving the parking lot when we arrived had obviously been and gone through hours hence, and there was no one else around that looked interested in getting soaked and going spelunking. So, it was up to me to just do it, and to convince Julie to come along with me. Is what I said to convince Julie (and myself) to give it another go. Headlamps on, balls steel, and GO! 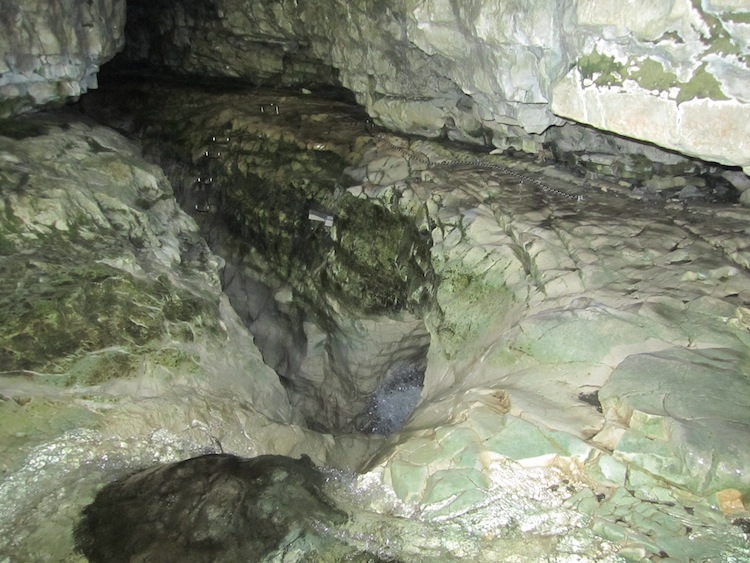 The first corner was actually still fairly well lit from the mouth of the cave, but the water had become much shallower already, so we decided to go to the next corner. We looked back, and it was pitch black in both directions, with the walls closing in around the weak beams of light from our headlamps. 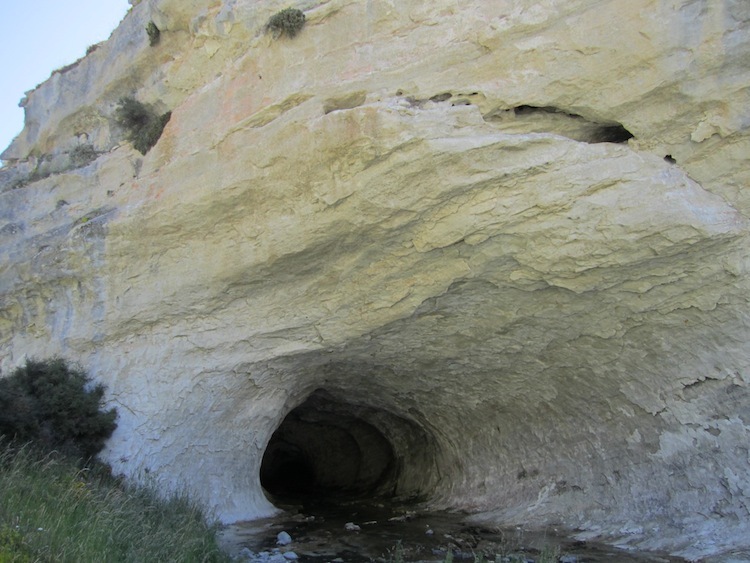 The walls of the cave were relatively smooth (good ol’ limestone! 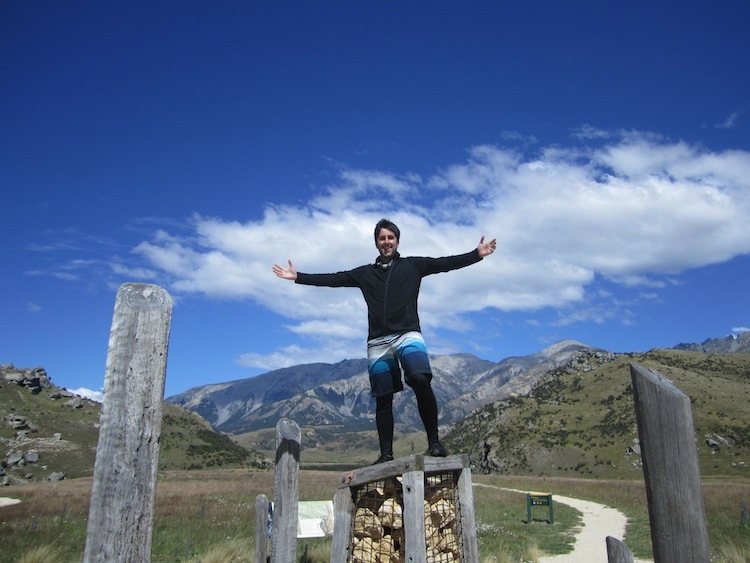 ), and well worn where many had passed before, boosting my quickly waning confidence, so we continued on. We came to a 1m waterfall that we’d been warned about, and decided to climb over, up and onwards. Still pitch black everywhere but where our lamps fell. The rushing water was the only sound, and I had to yell to talk to Julie who was following close behind. We’d already been inside for 15 minutes and must be halfway through by now, so there was no going back! No, they were not glowing eyes, but just the reflection of our lamps bouncing back off the slick rocks to our now-sensitive eyes. 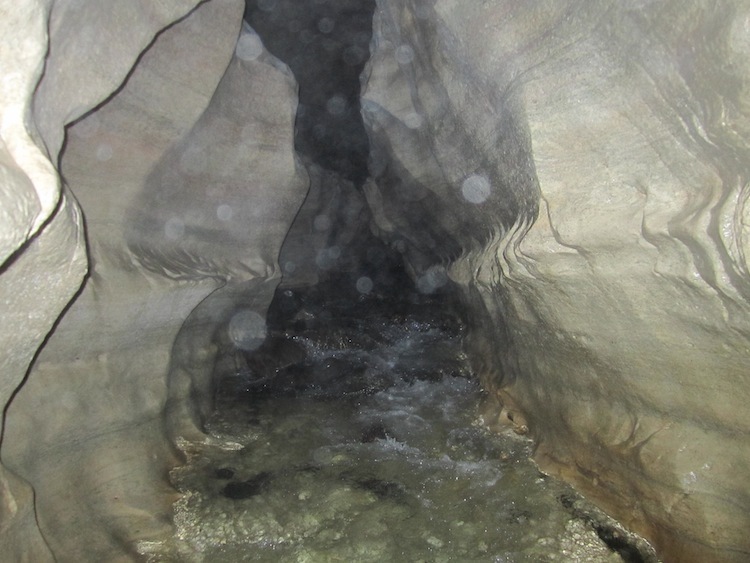 We kept going, up over each new little waterfall, and over many a large boulder blocking our path, battling swift currents and rushing water, until we must have gone a quarter of a kilometer along through the cave, hundreds of meters underground. And then I realized my light was getting dimmer. Of course I didn’t bring backup batteries, so I immediately turned my lamp off to conserve what little juice it had left in it in case Julies lamp failed for whatever reason, and made sure that she was not far behind so that her light could illuminate my path as well. 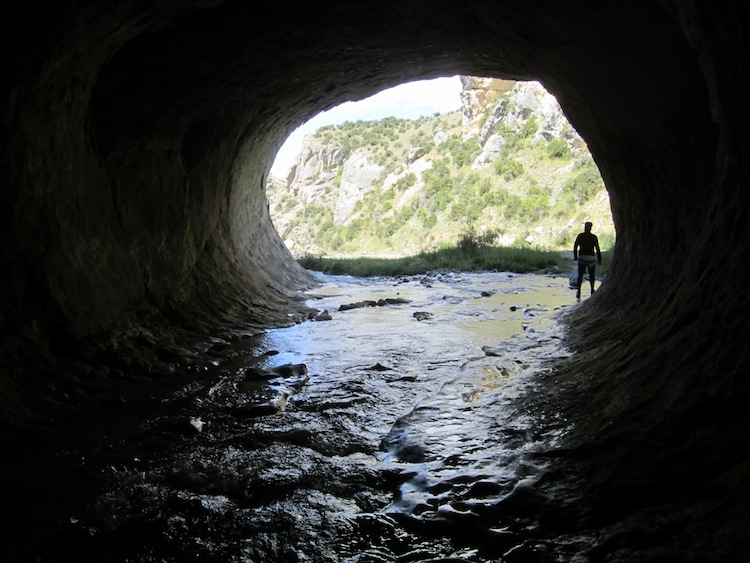 By the time we saw the proverbial (and literal) light at the end of the tunnel, we could not tell which were tears and what was stream water we were so happy. Of course they (the river gods? Mother Nature?) saved the most challenging part for last, and we had to scale a 3-4m waterfall (aided by iron rungs driven into the rock years prior) and crab crawl out of the cave, but the fact that sweet sweet daylight was shining in made any physical challenge seem minute compared to the psychological ordeal we had just forced ourselves through for the past hour. Days later, I still get shivers thinking about it. But, we are glad we did it, and have no regrets. In fact, we are both stronger for it, and have been able to pat ourselves on the back (over and over) for meeting this challenge we set before us and coming out unscathed. 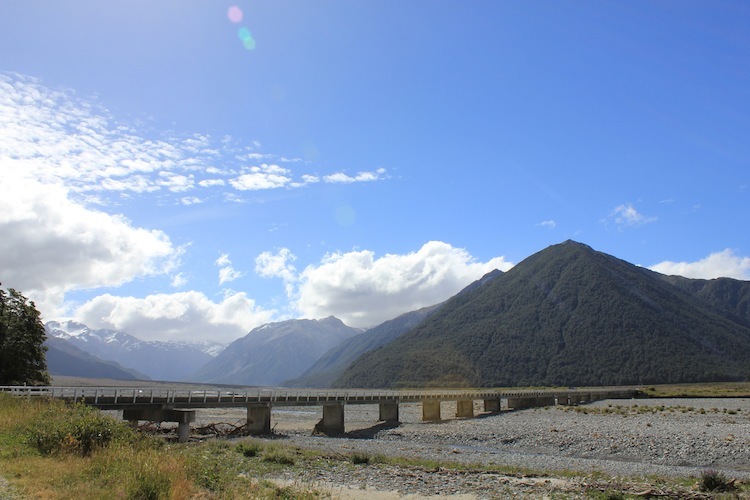 After thanking our lucky stars that we made it out alive, we took the wonderful outdoor trek back to the car still soaked head to toe, snapped some pictures, changed out of our wet clothes and got back under way towards Arthur’s Pass. 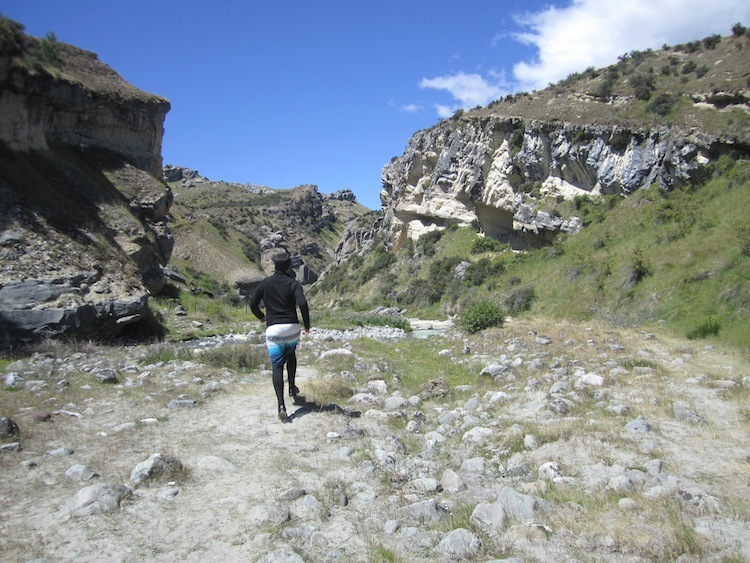 The mountains were very impressive, and we marveled at the breathtaking beauty of the surroundings as we proceeded onward and upward. There were a number of scenic lookouts, and as we came upon one particularly beautiful spot, we noticed what looked like a parrot sitting near the railing of the lookout. 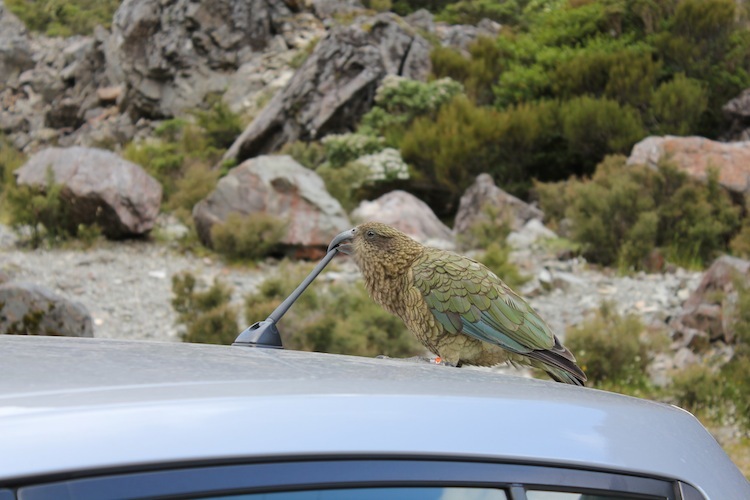 This ‘parrot’ had an imposing and razor sharp beak, so we slowly rolled down the windows to snap a quick picture, but were hesitant to exit the vehicle for fear of losing an eye. 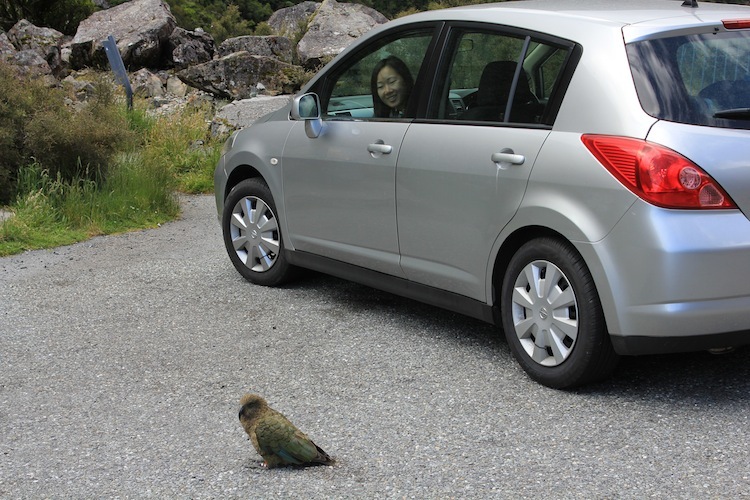 The bird shrieked loudly and hopped towards our car, probably hoping for a handout. Hmmmmm…. 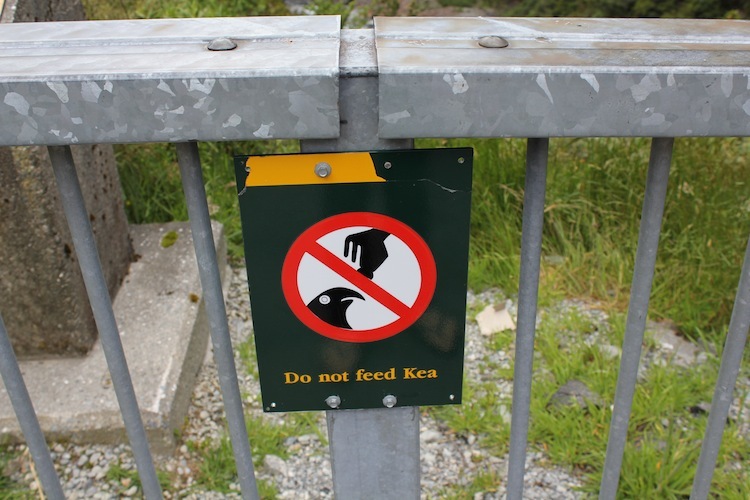 I quickly tried to think if I’d heard of a Kea before to determine if I could figure out its temperament, to no avail. 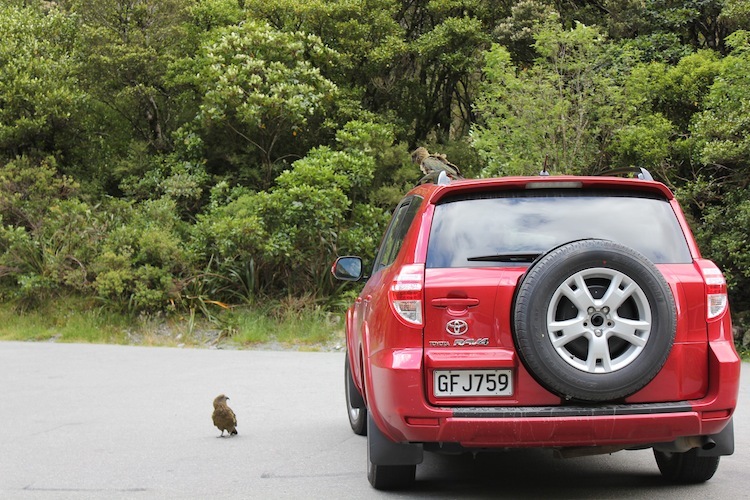 The Kea hopped around our car so that we couldn’t see it, and I couldn’t move the car for fear of squishing the little bugger. 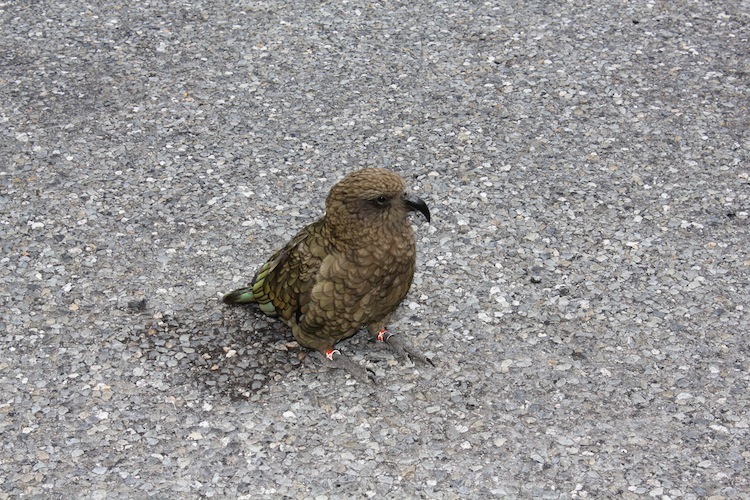 Then I noticed a number of other Keas perched in the surrounding trees (to which they blend in with very well), and owing to the fact that we were the only souls present in that particular neck of the woods, I immediately had a Hitchcockian (?) flashback and proceeded to have a mini panic attack. 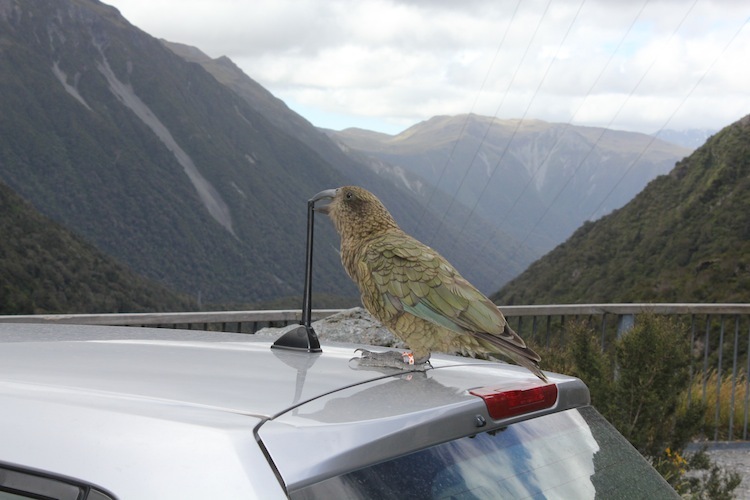 The bird then jumped up onto the roof of the car, and when he noticed that I wasn’t immediately throwing food his direction, proceeded to gorge himself on the black rubber/plastic fixed radio antenna. Yes, the bird was eating the antenna. I put the car in gear and rolled forward a bit and slammed on the brakes in the hope of dislodging the bird (like they do in the movies to get the bad guy off the car), but this did nothing but make the bird hold on tighter and dig his sharp claws into the plate steel of the roof. Yes, the bird somehow dug into the roof of the car while eating the antenna. 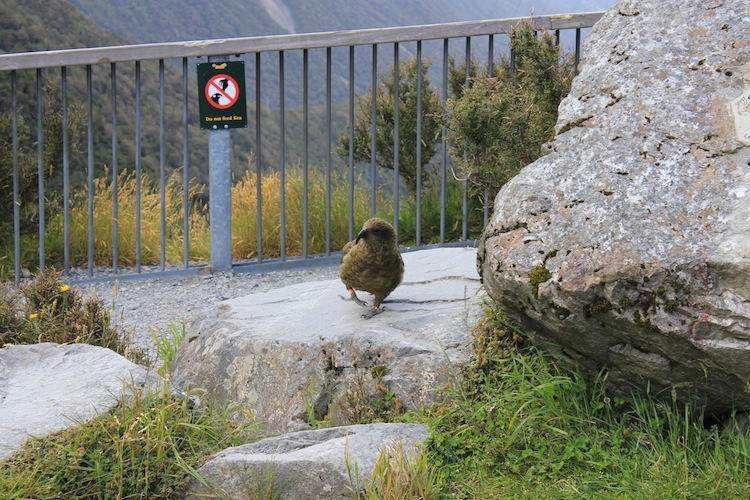 I gunned the car back down the hill leading to the lookout, swerving this way and that, and then slammed on the brakes at the bottom, thinking surely this must have assisted the Kea in finding a more comfortable perch. 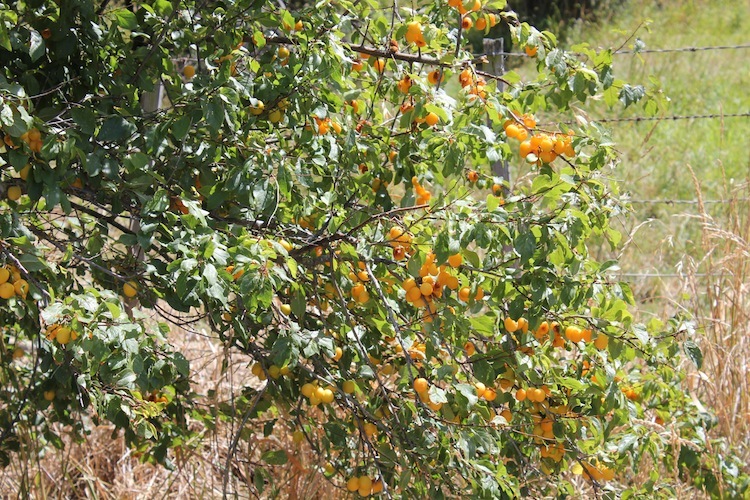 so going against the posted sign rules, but along with my better judgment (I didn’t want to have to pay for a new antenna and paintjob on the hired car), I tossed a locally grown wild mini plum out the window. The bird took the bait, and as his razor sharp beak tore into the juicy flesh of the offering, I sped off. I could hear the bird shrieking at me that I didn’t leave something more appetizing (apparently they like chocolate, even though it is fatal to them…), but we were away safely (minus the poor antenna), and that is all that matters. 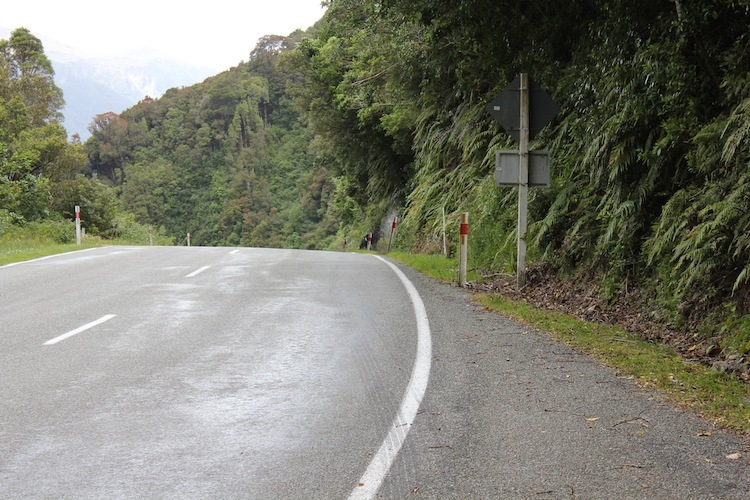 We briefly stopped at another lookout, but when we noticed some poor sap had made the same mistake we had (namely stopping to enjoy the views, only to be ambushed by a circus of Keas) , we took off before the conspiracy could get to us too. 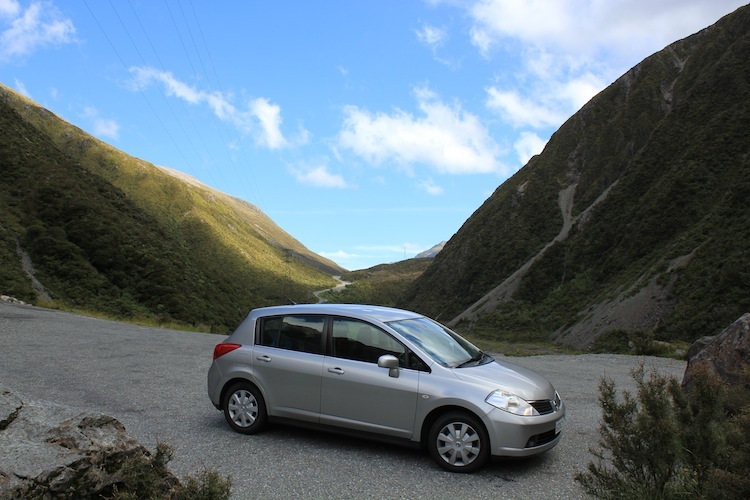 As the weather was looking continually more threatening, we drove the rest of the way to Greymouth with only one or two quick stops (one for me to soak myself again trying to collect ‘spring’ water from a roadside waterfall), and made it safely to our hostel. 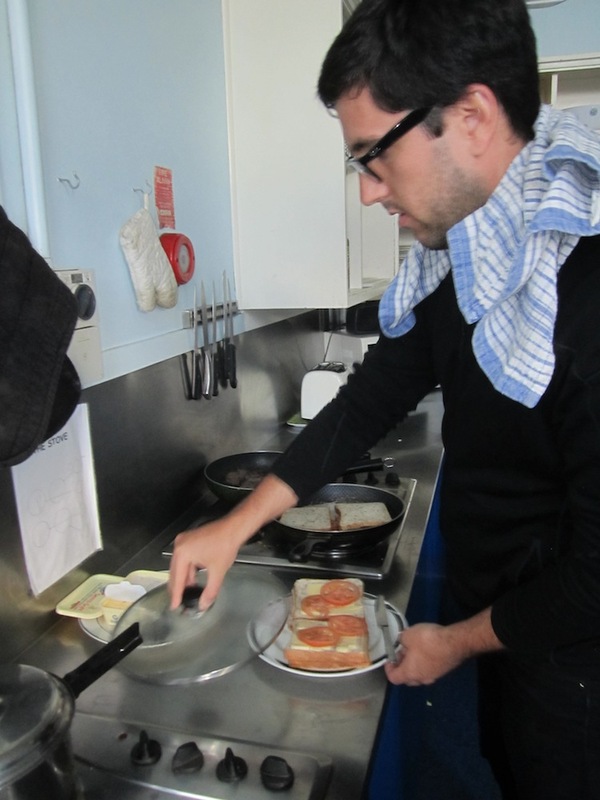 teaching an Israeli guy how to cook potatoes and fish, then going to bed dog tired from the full day of activities and near death experiences. 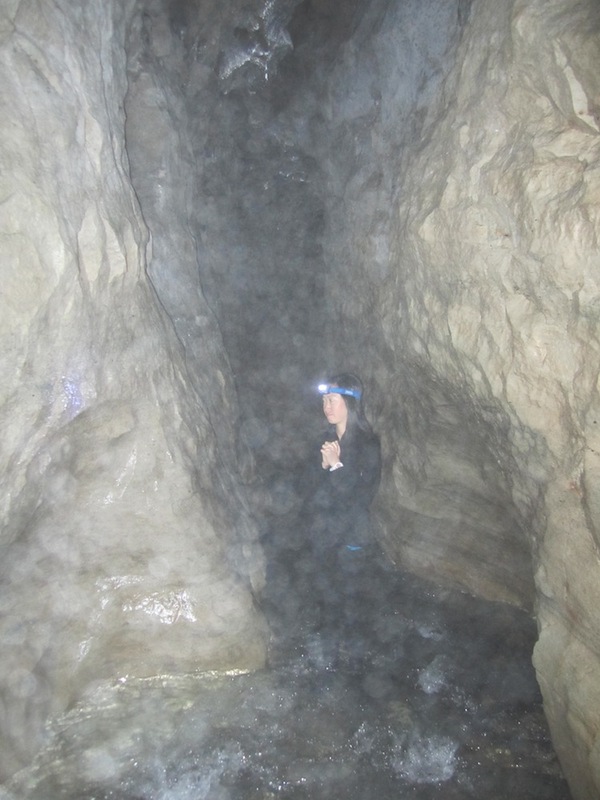 It’s great that you guys went through the cave, so brave, I’d never have done it, even with a guide. 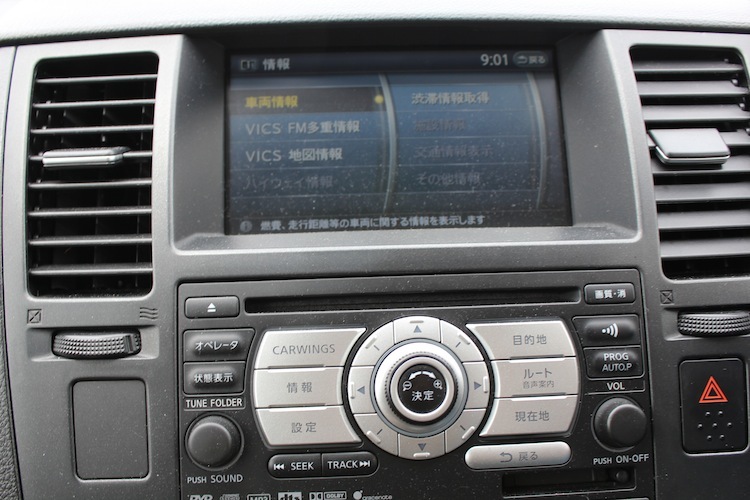 Your experience with the Kia was hilarious from my side but if I’d been in your shoes I’d also have tried to get rid of the bugger. Oh man I was really really really…. really really scared >_< It was dark and cold and wet. Bubbles were floating up inside my clothes, but I thought it was small critters getting in there @_@ My goal the whole time was to just get out of the cave! I rushed through it as fast as I could. In hindsight of course, it wasn't that bad.